The United States' national debt has surpassed $20 trillion, or nearly double what it was when former President Barack Obama took office in 2009. According to the latest numbers provided by the U.S. Treasury Department, the national debt passed the $20 trillion mark on Friday and continues to grow. To hit the milestone, the total debt increased $317 billion in one day after President Trump signed a bill on Sept. 8 that temporarily suspended the $19.84 trillion debt ceiling so that federal aid could be provided for victims of Hurricanes Harvey and Irma. For the first several months of Trump's administration, The Daily Wire reports, "the national debt saw a steady decline, dropping approximately $100 billion from the day Trump took office until last week." "From March 16 through Sept. 7, every Daily Treasury Statement showed the total federal debt subject to the legal limit opening and closing each day at $19,808,747,000,000," CNS News reported. "That was because the previous suspension of the debt limit had expired on March 15 and the debt limit had been reset at the level the debt reached at the close of business that day — which was $19,808,772,381,624.74." Known as the "total public debt outstanding," the two sources for the amount of national debt come from two entities, the "debt held by the public" at approximately $14.6 trillion and the "intragovernmental holdings" at approximately $5.5 trillion. The treasury defines "debt held by the public" as "all federal debt held by individuals, corporations, state or local governments, Federal Reserve Banks, foreign governments, and other entities outside the U.S. government less Federal Financing Bank securities" and "intragovernmental holdings" as "government account series securities held by government trust funds, revolving funds, and special funds; and federal financing bank securities." As part of his campaign, Trump vowed to tackle the national debt by "ending reckless and irresponsible spending, getting America's finances back into shape." 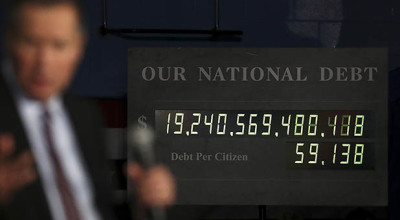 "It took America more than 230 years to accumulate its first $10 trillion in debt. Obama-Clinton policies doubled it, adding another $10 trillion to our national debt in a matter of eight years," Trump said in July 2016 during the presidential campaign. "These policies have left Americans jobless, entrapped them in failing school systems, and diminished our military." However, an analysis from the Committee for a Responsible Federal Budget released in September predicted that Trump would add $5.3 trillion dollars to the national debt. "The report finds that Trump's plan would result in an overall reduction in non-interest federal spending (that is, all government outlays not spent servicing U.S. debts) by about $1.2 trillion over the next decade," Time magazine reported last September. "He would do that by cutting Obamacare, Medicaid and other non-defense spending. But he would also slash about $5.8 trillion in revenue through his tax proposal, according the report."